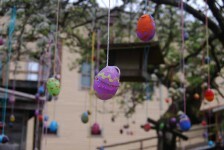 Come and join the fun at Kilby Historic Site’s Annual Easter Egg Hunt! There’ll be candy bags for everyone as children search the farmyard for Easter eggs. Decorate an egg to hang on our Easter Tree, spend some time with our friendly farm animals and play some old fashioned Easter themed games and crafts. Search for the golden egg for an extra special prize at the farmyard Egg Hunt. The egg hunt (and all other activities) begin at 11 am each day, and is on-going throughout the day. NB: This event takes place rain or shine! While we love animals of all kinds, we ask that you please leave your pet at home for this event. Thanks for your understanding!